In November we released an update to the Guide to Maintaining Roadworthiness. One of the updates in the new guide was about the use of tyres over 10 years old. Since then, we’ve received a few questions on what is expected of operators who use older tyres on their vehicles and trailers. I thought I’d write this blog to clear up exactly what’s expected of you and to answer some of these questions. The first thing to clear up is that our guidance doesn’t ban tyres of a specific age. 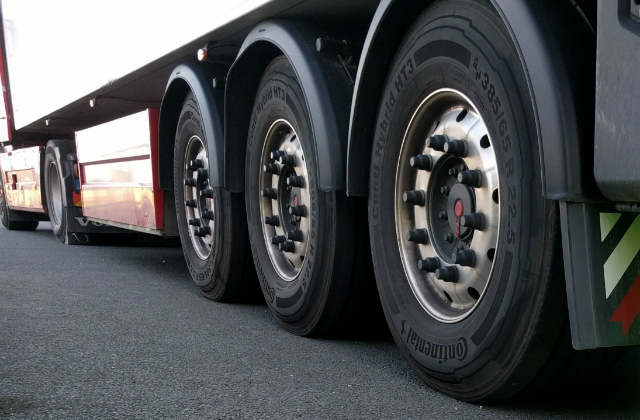 It only says that operators should have an adequate tyre management system in place and consider the risks associated with the use of older tyres. We’ve had lots of questions from people who own historic vehicles that are only driven to shows and events. They wanted to know if they needed to change their older tyres. First off, you should get all tyres of all ages regularly inspected by a competent person. This should be part of your tyre management and vehicle maintenance system. Some of you have asked if we’ll report you to the Traffic Commissioner if we catch you with a tyre more than 10 years old. If we find an operator with a tyre more than 10 years old, we’ll follow up to remind them of the guidance. We’ll also ask for assurance that they’ve done a risk assessment for their vehicle, taking how it’s used into account. We won’t take any further action if the operator shows they’re maintaining their vehicles well and have controls to reduce the risk of tyre failure. If they can’t show us that they’re managing their tyres and reducing risk, we would consider referring them to the Traffic Commissioner. Following a coach crash in 2013, concerns have been raised that older tyres are more likely to fail catastrophically than younger tyres. As a result, the Department for Transport (DfT) is currently researching the effect of age on tyre integrity. We expect the results of this research later this year. The DfT decided to introduce this guidance on the user of older tyres as a precaution while the research is still ongoing. Once the results have been received and reviewed, we may reconsider or refine our approach to older tyres. Keep your eyes peeled for updates in this area. As ever, we’re keen to hear what you think. Please leave comments below with any questions or anything else you’d like clarified. Could the DVSA tackle tyre manufactures so that the date stamp is on both sides of the tyre and perhaps much easier to find/see. Currently it is very time consuming to find the YOM especially if it's in the middle of a pair! As per another comment, I also wondered about age of retreads, as the original date will no longer be visible. Not that I have to worry about that as we no longer use retreads. You're a bit slow on the uptake of clarifying the use 10 year old tyres,on annual test,I was informed that 10 year old tyres we're unacceptable by a T.E.,I replaced those tyres, at a cost to replace 6 tyres being £2280.00, operating a local removal company average mileage was less than 50 Kilometres, 3 or 4 times a week. On adding vehicles of 12 years plus to my Operators License,I was informed that the "Guide to Roadwothiness" would be amended so that those vehicles would be compelled to be safety inspected every 6 weeks,I informed the Tutor on the New Operators course the Operative Word was "Guide" and my vehicle operators license stated that periodic test was 12 weekly.This being financially unviable, I sold all HGV's. Isn't it about time that the T.E. 's were brought up to date by the beareucrat's that sit on their brains and think up all these amendments. I have now down sized my vehicles to 3.5 tonnes as, when faced with a chronic physical inability, I used a Commercial Garage, for prep and test, 2 1/2 hours after dropping the vehicle at their premises it was presented forttest and failed on 5 unroadwothy points,yet they'd carried out periodic testing. The DVSA ought to review,any vehicle failures,presented by so called Professional Commercial Garages, in nearly 12 years of being an operator,I had 2 fails,with 2 to 4 vehicles both obtained by the use of commercial garages. Is the poor condition of UK roads compromising passenger safety and a major cause of tyre failure ? Why not repeat the information on understanding the tyre age markings already on the tyres when they are manufactured? I showed a fleet operator how to read the age markings recently and he was staggered that the info was even on his tyres! It is a good idea to have a regular inspection for older tyres if it is combined with normal checks for cuts,bulges and foreign objects caught up in and between tyres.I find it unusual that the minimum tread depth is still 1mm considering the weight and stresses these tyres go through. The DVSA know that not all operators or even manufacturer's main dealers have roller brake testers. Much as they would like to have an RBT report carried out with every driver's daily walk around check, they know that to be as impossible as demanding an RBT with every six week PMI. Many vehicles only carry anything approaching 65% of axle weight when presented for MOT because the operator just doesn't have access to anything heavy enough to put on the vehicle. This demand for ever more frequent loaded RBT prints out does not square with ULTAST acceptability nor with on board electronic brake data transmission being automatically acceptable regardless of what weight is carried. Two RBTs + MOT per annum and Tapley prints out for every 6 week PMI should be sufficient. I have just restored a rover p4 that had stood in a factory in the dry and warm since 1993 I removed the tyres that looked ok to check the condition and when deflated all had deteiorated to the point of being unusable,I think that all tyres that have stood unused for a length of time should be dismounted and checked properly ,this is where the 40 year old vehicle mot exemption falls down, I think that if an exempt vehicle changes keeper it should be tested as part of the change of ownership to stop anyone being fitted up with an unroadworthy motor. Sounds like another grey area to join the endless list,,, as a quailified mechanic and engineer I cannot see any issue with a 10 yr old tyre as long as its is inspected and legal,,, and you cannot tell me a 10 yr old Goodyear/Bridgestone or any good brand in good condition is any worse than a new cheap chinese tyre,, touch wood we have never had tyre issues on the road and we always take tyre pressures on our inspections and monitor betwen inspections,, I know we have tyres that are ten yr old but I am not about to go buying new tyres when these are still legal and perfectly safe,,, but try debating this at the road side with a VOSA man.....oh by the way how does this effect fleets that have recapped tyres !!!!! Hi Jon I think all recapped tyres should be banned, they should never be on the road. But there not though are they, and lots of big fleets use them,,, so there is a grey area straight away as I was speaking with a freind who is a manager at National Fleet and recapped tyres can be in excess of 10 yrs of age with no dates ! Er, a coach crash in 2013? This must have been really urgent action on DFT & DVSAs part. Well done. We are now extending this to lorries and have included it in the Guide to Maintaining Roadworthiness while DfT's research is ongoing. That was super useful. Please can you do an equally well written article on brake test requirements at PMI? Your guidance in the Guide to Roadworthiness is still a bit wishy-washy especially compared to the pretty robust standards that VE's and TC's expect leaving the door open to different interpretations by maintenance providers and/or operators. I welcome this clarification. There is a world of difference between an unladen classic vehicle, being driven within its limits, over a short distance, by an owner who is well aware of the age and condition of their tyres and a fully-freighted vehicle in commercial use, being driven by someone blissfully unaware of the state of them (or worse, a fully aware cowboy). Provided there exists a sensible way of policing the difference between these two extremes, I don’t think anybody can have any issue with an attempt to improve safety. Thank you for the update, things are much clearer now, lots of operators inc. owners of lightly used vehicles including ourselves were beginning to worry. I run a small fleet of articulated vehicles (4) involved in motorsport. Average annual mileage per vehicle is less than 5000. One truck the older one will be fitted with new tyres as they are 13 years old. The other trucks were fitted with new Pirelli tyres in 2008, wear is minimal. maximum gross weight is 22 tons. Vehicles are kept under cover during winter months. Vehicles have inspections every 10 weeks that includes tyre examination. Do I need to replace all of the tyres on these 3 vehicles? From what you've written it sounds like you have a maintenance system in place, which includes a tyre examination every 10 weeks. As we've said, you'll need to assess the risks of using the older tyres, particularly on the front axle steered wheels. The assessment should consider the axle load compared to the maximum allowed, the vehicle speed and journey length. If the axle load is close to the maximum and the vehicle travels at 56mph we'd strongly recommend that old tyres should not be used on the front axle. I'm glad this advice has come out as information given in T. E. was hinting at a ban on tyres over 10 Years old.